These two variations on a bread-and-butter pudding are economical to prepare, comforting to eat, and could easily be jazzed up to make a eye-catching table piece when guests were around: perfect Regency fare. Both of today’s recipes were borrowed by our ‘unknown ladies’ from Dr William Kitchiner’s Cook’s Oracle. Put on to boil a pint of good milk with half a lemon peel, a little cinnamon and a bay leaf. Boil gently for five or ten minutes. Sweeten with loaf sugar. Break the yolks of five and the whites of three eggs into a basin. Beat them well and add the milk. Beat in well together and strain through a tammis. Have some bread & butter cut very thin. Lay a layer of it in a pie dish and then a layer of currants & so on till the dish is near full. Then pour the custard over and bake ½ hour. Butter a quart basin and stick all round with dried cherries or fine raisins and fill up with bread & butter &c as in the above and steam it an hour & a half. Although bread puddings have been eaten by the British for many centuries, it was Dr William Kitchiner who popularised the particular variation known as ‘cabinet pudding’ when it appeared in his popular cookery manual The Cook’s Oracle. Several decades later Isabella Beeton’s Book of Household Management (1861) included an upmarket variation on the original ‘plain’ cabinet pudding, substituting the bread-and-butter for layers of sponge. In this new guise, the popularity of cabinet pudding extended long into the Victorian age. It was frequently presented at dinner parties with an elaborate decoration of jewel-like candied fruits, and the sponge was sometimes soaked in liqueur for that added touch of luxury. But Dr Kitchiner’s bread-and-butter has never gone away. It was widely eaten 1930s as a wholesome and tasty dish that respected the financial constraints of the Depression-era home. 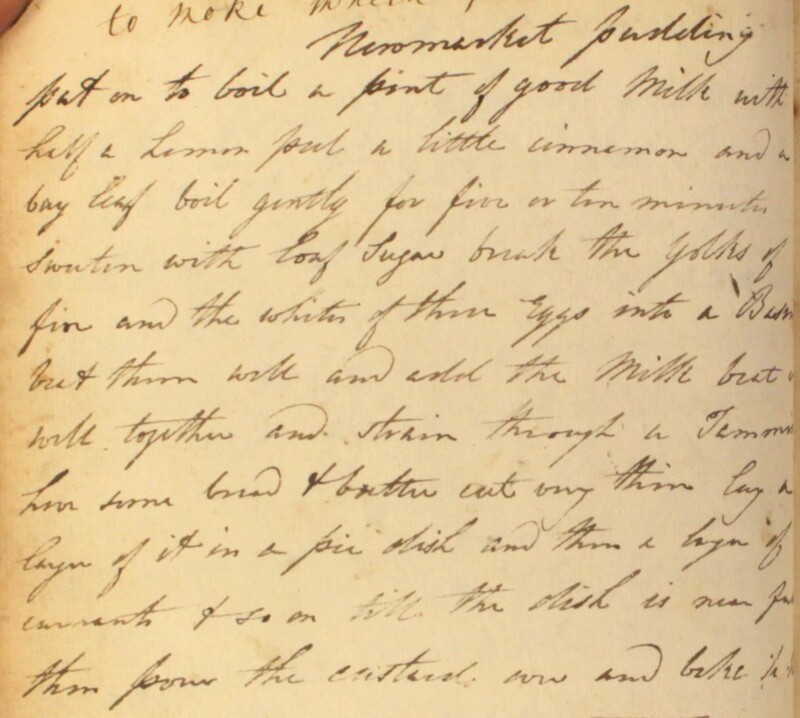 This entry was posted in 19th century recipes, Cookbook recipes, Puddings, cakes, biscuits (C19th) and tagged 19th century cookery, bread, Cook's Oracle, William Kitchiner. Bookmark the permalink.